We’re back from vacation and ready to move full steam ahead with the rest of season three. 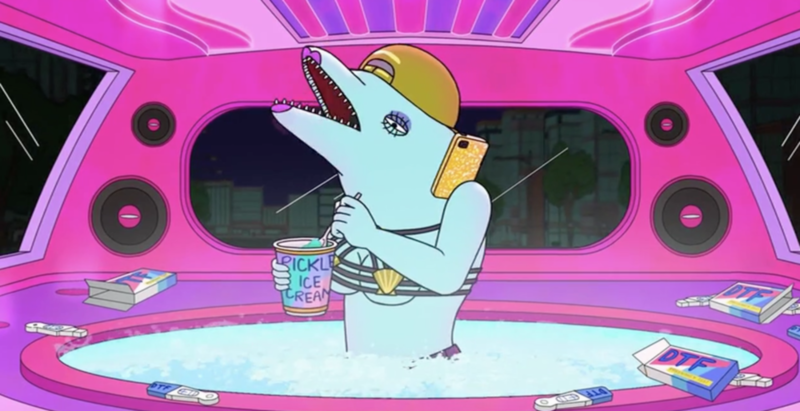 We talk about the meta narrative role of satire in Bojack Horseman, as well as Princess Caroline’s assertion that you can’t critique the systems you’re in unless you’re the best player in the game. Gatekeeping, inappropriate music videos and more. It’s a heady episode of Of Horses and Men with Lesley and Ben! Posted on April 17, 2019 by Infinity Break and filed under Season Three and tagged Lesley Yates Ben Hamlin. The box office numbers for Secretariat start to roll in - and it looks like Bojack’s dream project is an absolute success. Todd and Bojack go hit the down and, in the process, run into Emily - a old flame and friend of Todd’s from High School. The three of them crash a wedding rehearsal dinner and Bojack sabotages not one, but two relationships as he disrupts a lesbian wedding and any attempt at romantic connection between Todd and Emily. Meanwhile, in couples therapy, Diane discovers that she can’t communicate her emotions toward Mr. Peanutbutter until she takes a load of drugs, and Princess Caroline attempts to utilize her time off for romance. Lesley and Ben talk about the visual language of hallucinogenic drug usage, the complexities of Judah, whether or not film festivals really matter and LESLEY’S NEW CAAAAAAT. Posted on March 20, 2019 by Infinity Break and filed under Season Three and tagged Lesley Yates Ben Hamlin. It’s an in depth examination of the way we consume media, millennial attention spans, visual storytelling, pantomime, intimacy and loneliness and so much more on this submerged episode of Of Hoses and Men with Lesley and Ben! It’s the underwater episode. 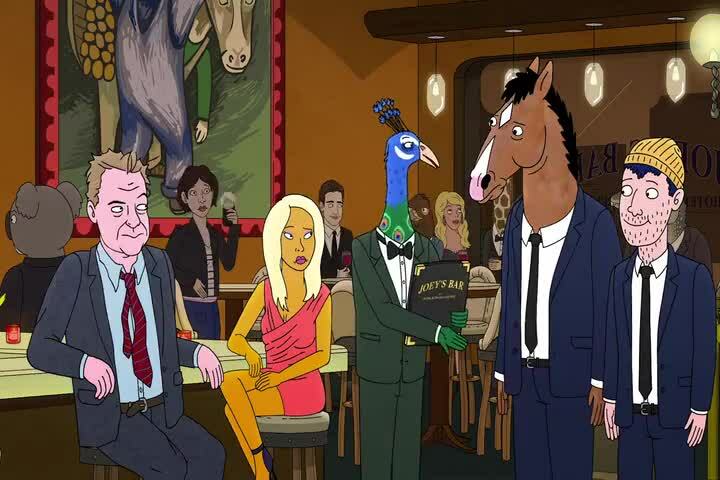 As part of his award tour, Bojack Horseman is asked to go get on a plane and attend a premiere of Secretariat in a foreign market. Except that by a plane, she means a submarine and by a foreign market, she means the ocean. Completely unable to comprehend the culture around him and seemingly unable to speak, Bojack finds himself a stranger in a strange land. Which would be fine, if he were not sharing the open seas and this film festival with Kelsey Jannings. Posted on March 2, 2019 by Infinity Break and filed under Season Three and tagged Lesley Yates Ben Hamlin. Not to get Marxist on main or anything, but Lesley and Ben tackle happiness culture and the idea that hard work and commodities will make you happy. It’s a very philosophical episode of Of Horses and Men. Meanwhile, Mr. Peanutbutter and Diane’s relationship begins to strain even further as Diane continually neglects and ignores her husband while on this adventure. Posted on January 30, 2019 by Infinity Break and filed under Season Three and tagged Lesley Yates Ben Hamlin. Hope you all like Starbucks humor! Remember during the previous episode when that one reporter brought up the Bojack Horseman show? And how Jill Pill mentioned Bojack’s /actual/ previous show? Haha what was up with that? Posted on January 23, 2019 by Infinity Break and filed under Season Three and tagged Lesley Yates Ben Hamlin. The Secretariet Press Tour is underway as Bojack Horseman and Anna Spanakopita go through round after round of press interviews for Bojack’s Oscar bait blockbuster. Bojack gets increasingly defensive when more of the film journalists he’s interviewing with assert that Horsing Around was not a good show. Our star is forced to come to grips with the fact that he has to trash part of his past to move into his future While in New York, the city of dreams, Bojack is courted by Avant Garde playwright and marionette mastermind Jill Pill who offers him a chance to be her latest theatrical star. Bojack leaves the meeting asserting that he’s not an actor that takes risks, but not even later that day, he screws up a one night stand in such a way that the future of his film may be in jeopardy. Meanwhile, Princess Caroline is managing her new agency with efficiency and Meanwhile Meanwhile, Todd gets lost in New York. Posted on January 10, 2019 by Infinity Break and filed under Season Three and tagged Lesley Yates Ben Hamlin.